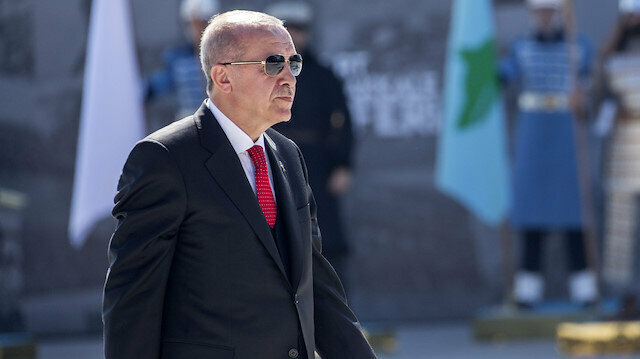 Turkish President Recep Tayyip Erdoğan on Monday said Istanbul will never be turned into Constantinople, in reference to the manifesto of the terrorist behind the New Zeland mosque attacks. Speaking at an event marking the 104th anniversary of the Çanakkle naval victory in 1915, Erdoğan warned against entertaining such thoughts about Istanbul. "You can never make Istanbul into Constantinople. Your grandparents came before you and saw what we're made of, and they were sent back alive or in coffins. If you were to come with the same intentions, we will be expecting you. There's no question you will receive your grandparents' sendoff from us," vowed Erdoğan. At least 50 people were killed when a terrorist opened fire on worshippers during Friday prayers last week at the Al Noor and Linwood mosques in Christchurch, New Zealand. About as many were injured, with several still in critical condition. In his so-called manifesto, Australian terrorist Brenson Tarrant threatens to kill all Turks living in European lands of Turkey and elsewhere west of the Bosporus. He also expresses his desire to demolish the famed Hagia Sophia in Istanbul and its minarets. "We are coming for Constantinople and we will destroy every mosque and minaret in the city. The Hagia Sophia will be free of minarets and Constantinople will be rightfully Christian [sic] owned once more," it says. “We speak once again from Canakkale after 104 years, and say we have received your message,” Erdoğan said during ceremonies marking the 104th anniversary of the Battle of Çanakkale, commemorating the martyrs in the historic victory.